Can you verify the identification of the pictures below? If it is a timber man's scribe, can you describe exactly how the tool would have been used? The round cylinder on the side looks like a chalk holder of some sort. I would appreciate some information on the use of all the different parts of this tool. This tool was found underneath the front seat of an old truck from Oklahoma. Your item is not a timberman's scribe. 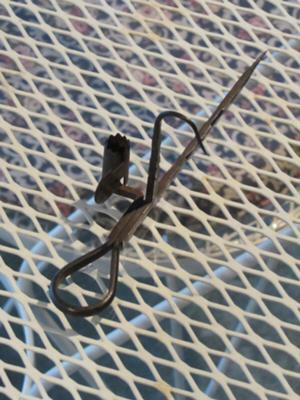 It is an old miners tool, sometimes referred to as a "sticking tommy". To use it the miner wedged the point into a seam in the rock with the hook facing down. The round part held a candle and the hook was probably used to hold a lunch pail.